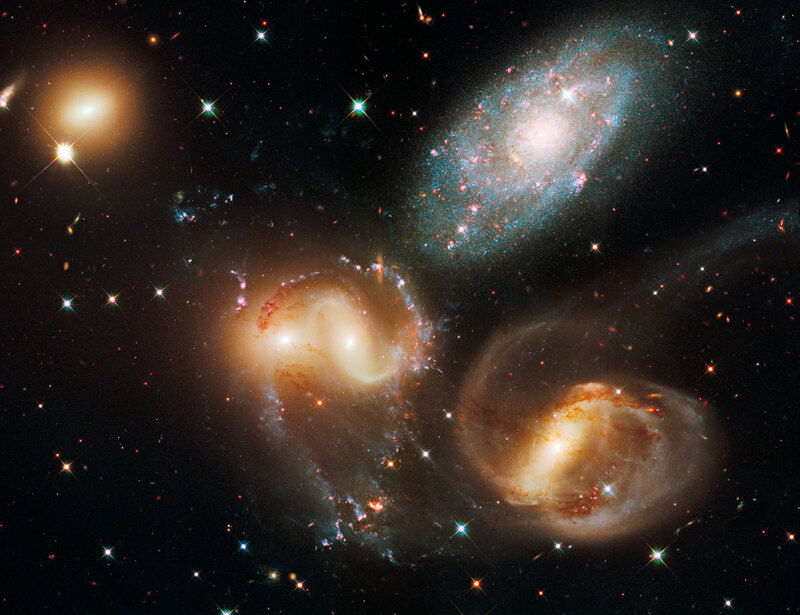 STScI-PRC2009-25d The first identified compact galaxy group, Stephan's Quintet is featured in this stunning image from the newly upgraded Hubble Space Telescope. About 300 million light-years away, only four galaxies of the group are actually locked in a cosmic dance of repeated close encounters. The odd man out is easy to spot, though. The four interacting galaxies (NGC 7319, 7318A, 7318B, and 7317) have an overall yellowish cast and tend to have distorted loops and tails, grown under the influence of disruptive gravitational tides. But the bluish galaxy at the upper left (NGC 7320) is much closer than the others. A mere 40 million light-years distant, it isn't part of the interacting group. In fact, individual stars in the foreground galaxy can be seen in the sharp Hubble image, hinting that it is much closer than the others. Stephan's Quintet lies within the boundaries of the high flying constellation Pegasus.